Did people living in the Stone Age have toilets? Yes, at least some of them did, we have found examples of indoor plumbing from the Neolithic or later stone age! 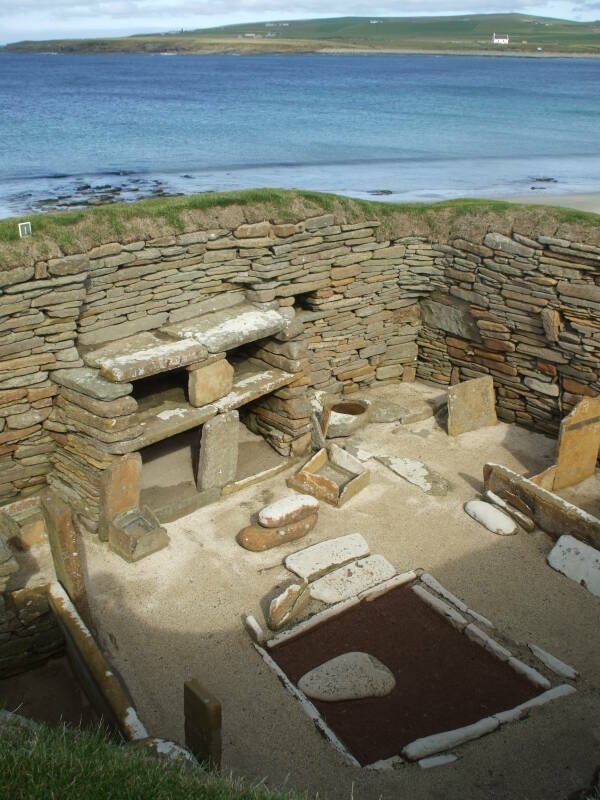 Skara Brae is a large Neolithic settlement on the Bay of Skaill on the west coast of Mainland, the main island of the Orkney Islands, just off the north coast of Scotland. It is a cluster of eight dwellings and it was occupied roughly 3100-2500 BC. The dwellings contain what are believed to be some of the earliest examples we have found so far of indoor toilets. 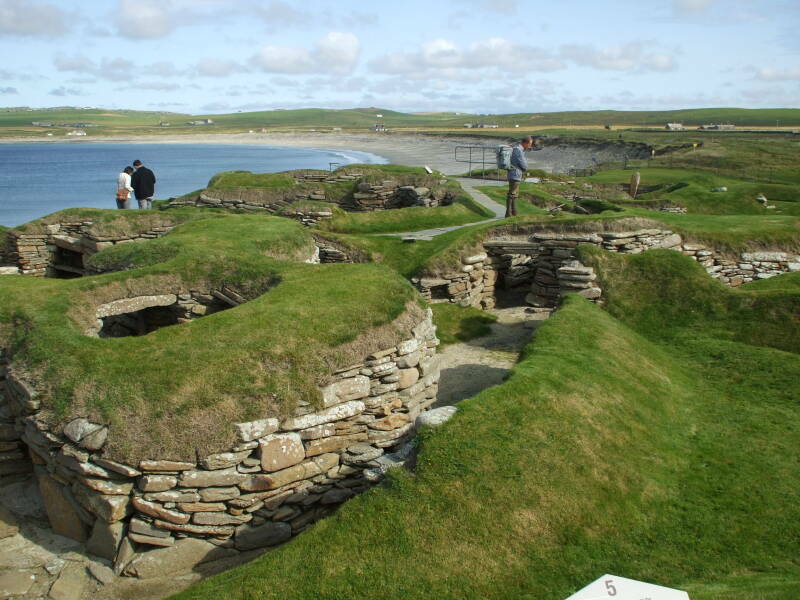 Skara Brae is Europe's most complete Neolithic village and it was discovered only in 1850. It was well preserved when it was discovered, and the early excavations were unusually careful for that time. The settlement was built on, and into, a midden heap from a previous settlement. That is, a mound of domestic refuse, or bluntly, an old garbage dump. That material provided insulation against the harsh winter climate at that latitude. The structures were connected with narrow curving passageways that were also covered to protect the entire settlement from the weather. The small size and curving paths of the passageways limited the wind blowing through the communal structure. Each of the houses, about 40 square meters in size, was based on a large square room with a hearth at its center. 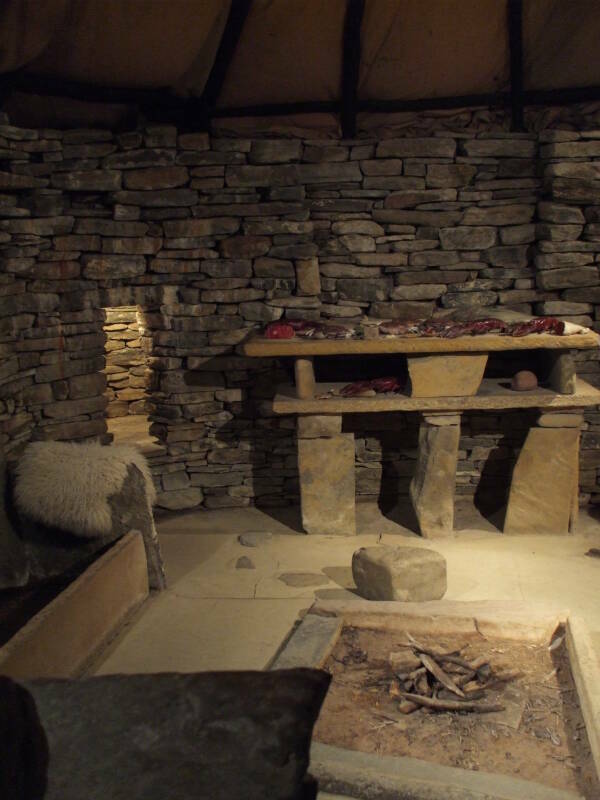 The hearth was used for heating and cooking. Some researchers concluded in the 1930s that peat was used as the fuel. However, more recent detailed analysis of vegetation patterns suggests that thick beds of peat did not develop here until after the settlement was abandoned. Driftwood and animal dung are possible sources of fuel. The people who lived here raised cattle and sheep, and there is some evidence suggesting that barley was cultivated. They also caught fish and collected shellfish. But it's not clear that there would have been enough combined driftwood and dung available to maintain the fires through the long winters. Dried seaweed seems to have been a significant source. There is evidence in the form of a glassy, slag-like material that seems to be a product of burning seaweed. 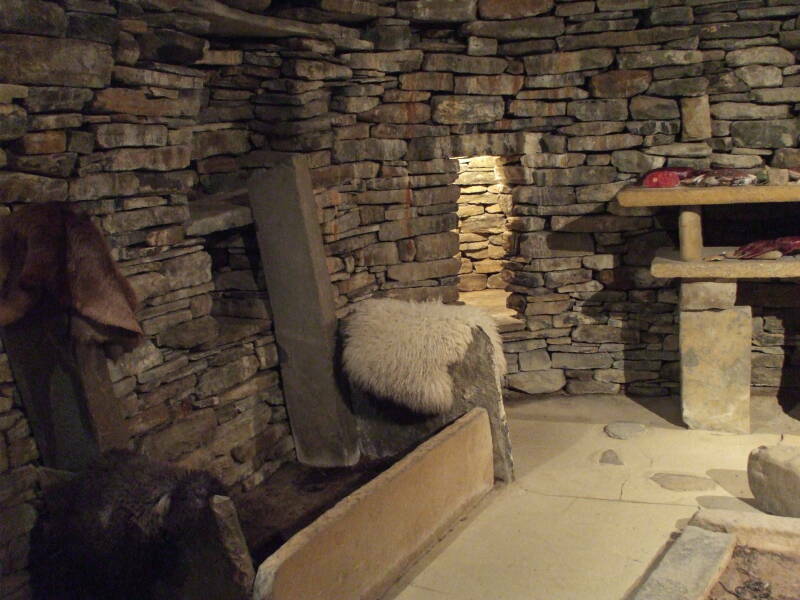 The walls and furniture are built from stone. The local sandstone splits into plates or sheets suiting it for certain types of construction. There were few trees on the Orkney Islands in the Neolithic era, and almost none today. They used driftwood and whalebone to form frames for the roofs. Some of the driftwood came from northeastern North America along the clockwise gyre of the north Atlantic. Sheets of turf would have been laid over that framework with thatch on top, much like what has been used in the Highlands and the Outer Hebrides through the early 20th century. 2,500,000 — 10,000 BC Paleolithic Origin of man, development of stone tools, Homo sapians neanderthalensis appeared in Europe 600,000 to 350,000 years ago and disappeared by 30,000 BC. 10,000 — 2100 BC Neolithic Began about 10,000 BC with the development of farming crops of einkorn wheat, millet and spelt, and the keeping of dogs, sheep and goats. Farming communities appeared at Jericho about 8500 BC and spread to Asia Minor, North Africa and North Mesopotamia by 8000 BC. Jericho (now in Palestine) is often referred to as the first city, going back to about 10,000 BC. Çatalhöyük (now in Turkey) is another early large settlement, from 7500 BC. Agrarian societies appeared in southeastern Europe by about 7000 BC and central Europe by about 5500 BC. 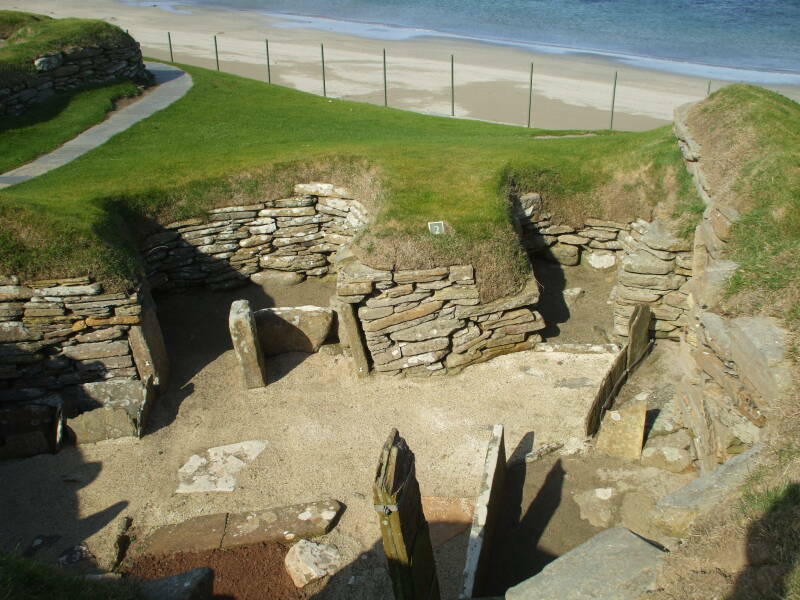 Skara Brae was occupied about 3100-2500 BC. 2100 — 700 BC Bronze Age Development of metals, specifically bronze, an alloy of copper and tin. 700 BC — 450 AD Iron Age Period when the main technology was based on iron. The right-side bed was the larger one in every one of the houses. 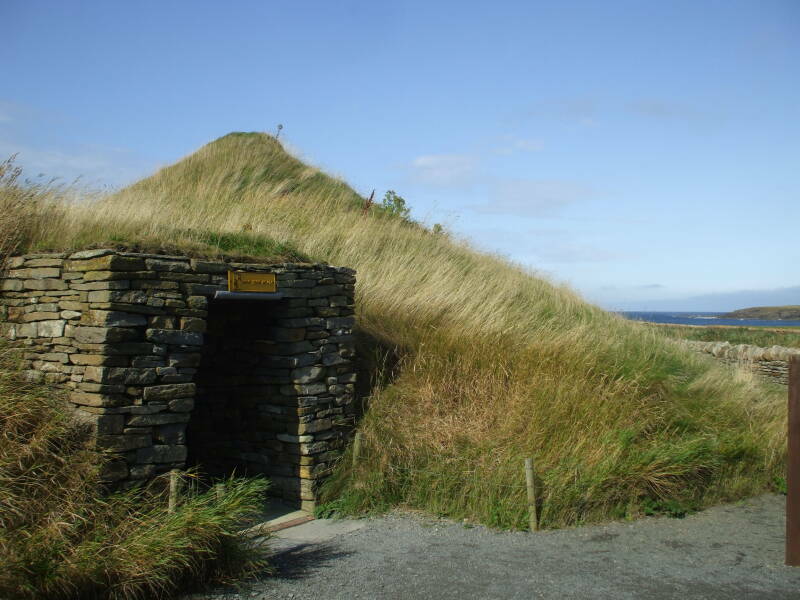 Lloyd Laing's Orkney and Shetland: An Archaeological Guide compares this to a custom that survived into the 20th Century in the Hebrides Islands off the northwest coast of Scotland, in which the husband's bed is always larger than the wife's bed. Artistic material including beads and paint-pots have been found in some of the smaller beds, providing some support for this theory. Other interpretations are more definite. For example, Pillars of the Past, Volume Four, simply states that the cells were a primitive form of toilet. 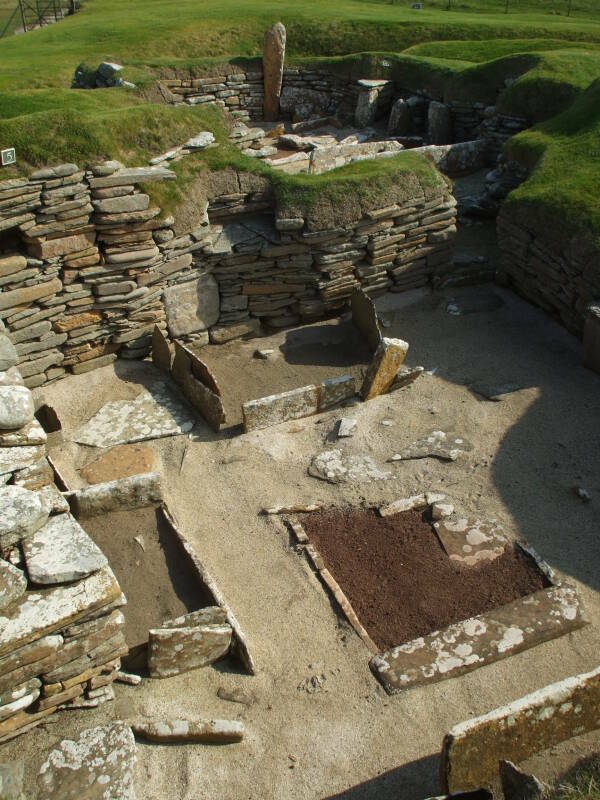 Skara Brae was clearly not a large settlement and its people could easily have left their filth in the nearby fields to act as fertilizer. 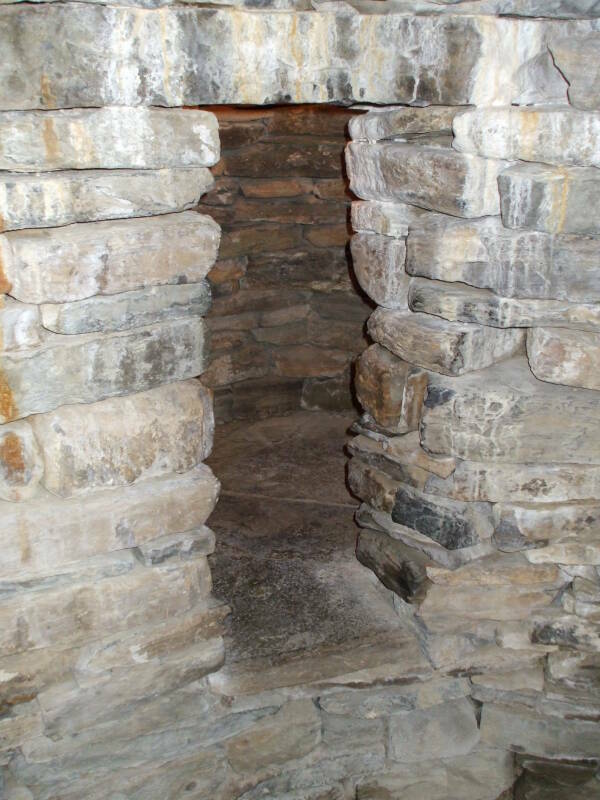 With a population estimated from between 50 to 80 people, they had to go out of their way to construct at great cost and effort a sewer system attached to what were apparently separate toilet rooms, thousands of years before such conveniences had become common in the first millennium cities and towns in the ancient world. 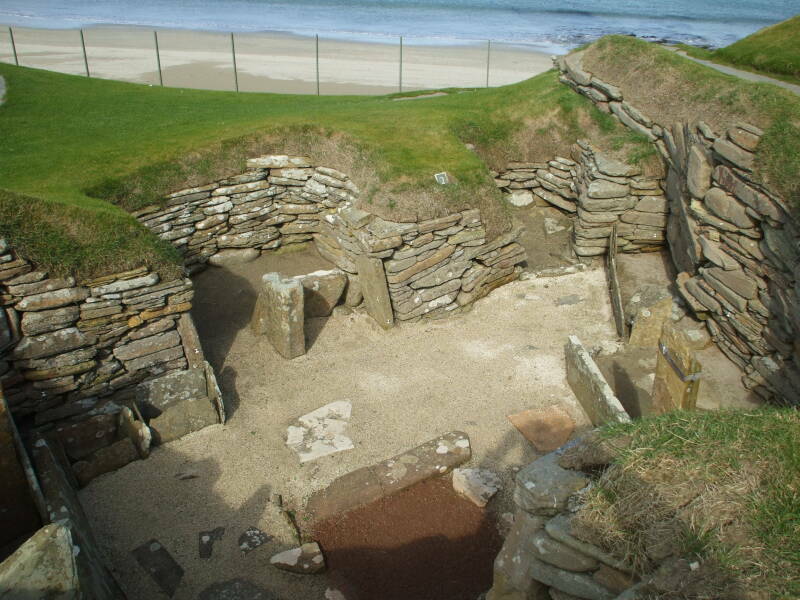 So, are the Skara Brae cells Neolithic era toilets? Probably. Some people say that they are. Some say that they may be. No one seems to be saying that they definitely aren't, or offering any specific alternatives. The cell of this dwelling is at upper right in these views. They have replaced the glass roof with one of sod, maintaining a much more constant environment inside the house. This unfortunately means that you can't see it. To make up for this, they have reconstruced an exact replica that you can enter. Here is a map of the UK. The Orkney Islands are just off the northern coast of Scotland. Almost certainly if you aren't British, and quite likely if you are, you will travel to Orkney by way of Edinburgh. See the National Museum's collection before going to Skara Brae, and see it again afterward when it will make more sense. Some of the collection is available online.